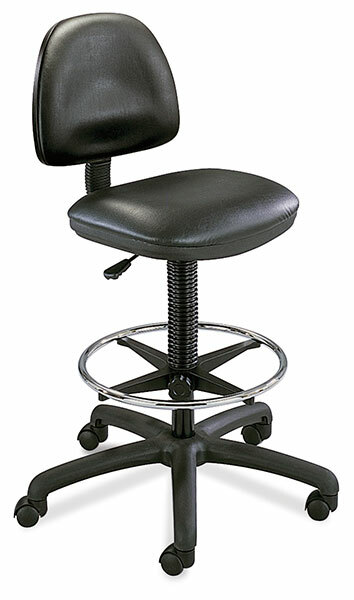 This chair offers comfortable, affordable seating at the perfect height for drafting tables. It has a fully-contoured swivel seat and backrest with waterfall edge and dense, resilient padding. The pneumatic lift adjusts height from 24" to 31" with just a touch of your fingers. The back has manual height and angle adjustment and double-curved posture support. Its five-spur base has dual, nylon-hooded casters for durability and saftey. The chrome footring has an adjustable height.